The world will never forget the thousands of people who lost their lives and the millions of others who were affected by the devastating terrorist attacks that occurred on Sept. 11, 2001. While we pause to remember the victims, we also take a moment to reflect on the bravery and sacrifice of those who served, and are currently serving, to keep us safe within our communities. In honor of those first responders who lost their lives, and those who continue to serve, the UCCS athletic department took a moment to recognize Colorado Springs servicemen and women. The UCCS volleyball team held their home opener at 7 p.m. on Sept. 11 against the No. 1 ranked School of Mines. It was there that Colorado Springs first responders and their departments were recognized. 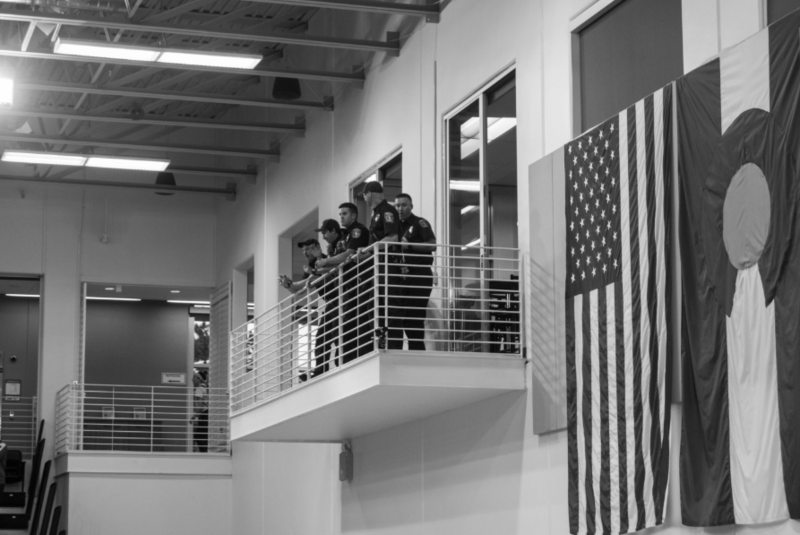 Representatives of the Colorado Springs Fire Department, the El Paso County Sheriff’s Office and the UCCS Police Department stood with the coaches as their service departments were honored during the match’s introductions. “When people thank a first responder for their service, it is nice to hear,” said Marc Pino, Executive Director of Public Safety and Chief of Police at UCCS. This commemoration at the volleyball home opener game was evidence of how our nation bands together in support when tragic situations occur, even if it is 17 years later.